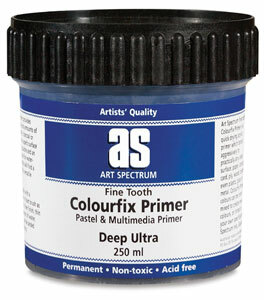 Art Spectrum Pastel and Multimedia Primer colors are permanent and non-toxic. They're the same primers used on Colourfix Papers, also available from Blick. Art Spectrum Pastel and Multimedia Primer provides a fine, positive tooth to hold extra color on your work (and less on the floor). Apply the primer with a dampened brush, sponge, or roller, straight from the pot. Brushes wash out in water. These quick drying acrylic primers bond solidly to almost any clean paper, canvas, card, plastic, glass, ceramic, or even metal. All colors can be intermixed to create new shades. White can be tinted with acrylics, Liquid Spectrum Inks, or Art Spectrum Gouache. Available in 16 colors, in 250 ml (8 oz) plastic pots. Clear is also available in a 1 L (34 oz) size.